You’ve heard so much about yoga, you know it’s supposed to be great for you by making make you fit, flexible, focused and stress free. But, if you don’t know where to begin, if you’re doing it right, or even know what yoga is, we’ll help guide you, step-by-step. A basic way to begin is with our simple and friendly Beginners Workshop. We strongly recommend these workshops to help ensure your journey starts from the most enjoyable and empowered place possible. And, chances are, you’ll meet a new set of yoga-friends along the way! These intimate group experiences offer a safe, nurturing and inspiring setting to begin your yoga journey. You will leave the workshop understanding basic yoga techniques and foundation poses to help you feel confident in a scheduled group class. and we repeat things a lot so you are sure to learn! Cost - R450 which includes unlimited FREE Yoga classes for the month of June. Full payment can be paid in cash at the studio or via EFT before 3 June. Banking details on request. More tips to follow soon. We look forward to sharing this wonderful journey with you. Meditation workshop is a brilliant place to learn how to meditate, as it offers vital basics on meditation, so enrolling in one is extremely beneficial if one wants to learn about meditation. Meditation can bring about amazing stress reducing benefits, hence it is important that you consider its use in everyday life. In our high pressured lives, stress reduction is of the utmost importance. In this meditation workshop, you will acquire knowledge on the basics of meditation. You will get information on how to practice personal meditation safely. It is an intensive course in meditation and is ideal for busy individuals who want all the basics and would then go away and reflect on what they have learned as well as practice it, bringing about all the benefits. You will find after taking this meditation workshop, that you’ll became very calm and collected, which will be translated into better relationships with all those around you. Meditation improves your mental well being. You have a clearer mind as well as better concentration, so the vast wealth of benefits meditation brings is unbelievable. To tap into this vast mine of potential, one has to take that first step and the easiest route is through this meditation workshop. Meditation workshop is a brilliant place to learn how to meditate, as it offers vital basics on meditation, so enrolling in one is extremely beneficial if one wants to learn about meditation. Meditation can bring about amazing stress reducing benefits, hence it is important that you consider its use in everyday life. In our high pressured lives, stress reduction is of the utmost importance. In this meditation workshop, you will acquire knowledge on the basics of meditation. You will get information on how to practice personal meditation safely. It is an intensive course in meditation and is ideal for busy individuals who want all the basics and would then go away and reflect on what they have learned as well as practice it, bringing about all the benefits for your mind and heart, intellect, senses and emotions. YOU CAN REGISTER HERE. Call Laurence 083 632 9434 for details regarding completion of your booking and payment. Ayurveda, adjusting, sequencing, mantra chanting, meditation and other traditional and contemporary Yoga techniques.these techniques as well as guided practice of the techniques. In conjunction, you will learn Patanjali’s Eight Limb yoga philosophy and how you can incorporate this into your own practice and day-to-day life. Daily chanting, meditation and pranayama provide spiritual structure and compliment the more physical practices of the curriculum. team of teachers will guide you from the fundamental stages to teaching with ease. Deposit payable on reservation R 5500. Balance payable 7 days prior to 20 February. On reservation or by request we will email you a a small document for signature and a comprehensive breakdown of our 200 TTC. It's that time again !! Our annual FREE YOGA ON THE BEACH EVENT. This 75 min yoga extravaganza is suitable for all levels , men and woman , young and old , bring a mat or a beach towel , a bottle of water , and of course your body and open mind. Yoga is an excellent workout to perform indoors on a mat, but practicing yoga poses (asanas) on the beach is also appealing and has many benefits. So, why try yoga on the beach? I will offer a few good reasons to give it a try if you live near any type of beach. #1 Performing yoga in the sand strengthens secondary muscles in your feet , hips , knees and shoulder joints says instructor Laurence Milner , co owner and instructor at Chaitanya School of Yoga in Tableview . #2 It is relaxing to perform yoga on the beach What better way to get the ultimate mind, body experience than by performing yoga on the beach? Imagine listening to the sound of waves, smelling saltwater (for those near the ocean) and feeling the gentle touch of sand. No music is necessary because nature provides it own unique sounds, allowing one to relax while practicing asanas. #3 Fresh air helps the body The body needs fresh air to receive a stable supply of oxygen. Negative ions are found in fresh air that is near plants and trees, around flowing water and after thunderstorms. Crisp air has many benefits such as building the immune system, improving metabolism and giving one a sense of satisfaction by changing the serotonin levels in the brain. Schedule – Warming up , Pranayama ( breathing ) , asanas ( posture holding ) , a little flow ( Vinyasa ) , relaxation and to end off , a small meditation . 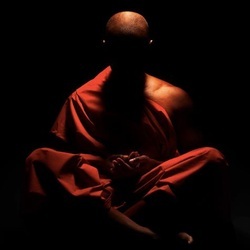 In Zen Buddhism , Zazen literally means seated meditation and is a meditative discipline practitioners perform to calm the body and the mind , and be able to concentrate enough to experience insight into the nature of exisitence and thereby gain enlightment. Zazen is considered the heart of Zen Buddhist practice . The aim of Zazen is just sitting , that is , suspending all judgemental thinking and letting words , ideas , images and thoughts pass by without getting involved in them. This 75 minute introduction will teach you the basics of Zazen , how to prepare and practice in your own environment , calming you and therefore making you more productive in your daily life , see how relationships improve , how much better you sleep and also how much better you are able to cope with life's daily stresses. trained internationally, and brought Shakti Dance back to South Africa in 2011, where she has been pioneering this beautiful conscious movement practice in Cape Town and also been teaching workshops and at yoga festivals countrywide. A special morning awaits you. All welcome. A gentle yoga & movement practice suitable for men and women, suitable for beginners and all levels of yoga practitioners, no dance or yoga experience is necessary to participate. This will be the best way to start off the weekend, with a stretch & a dance! Dancing with your inner Shakti-energy enlivens, uplifts and will bring greater unity, balance, joy and harmony to all aspects of your life ! Bring a mat. Wear comfortable, loose-layered clothing, bring some water to drink. An open mind & open heart. Address: Samurai Studio, 113 Circle Road ,Tableview, Cape Town. *Pre-book your place at a special early-bird price of R125 (book before the 15th July. R150 (if booked and paid after 15th July). Drop-in welcome on the day. Its a big studio, we want to fill it up! Bookings: Email: chaitanya.yoga1@gmail.com, or call Laurence at 083 632 9434. You will find after taking this meditation workshop, that you’ll became very calm and collected, happier, which will be translated into better relationships with all those around you. Meditation improves your mental well being. You have a clearer mind as well as better concentration, so the vast wealth of benefits meditation brings is unbelievable. To tap into this vast mine of potential, one has to take that first step and the easiest route is through this meditation workshop. Namaste fellow yogis and yoginis . Having attended various yoga festivals and thoroughly enjoyed being on the other side of the mat ( for a change ) , we have decided to once again try to unite the Cape Town ( Western Cape ) yoga community for a gathering of exclusive yoga. Most of us regularly attend our own schools albeit Vinyasa , Kundalini , Ashtanga , Hatha etc and the aim of this workshop is to expose the more unusual styles of yoga that exist out there . With this theme in mind we present to you , three ( 3 ) back to back 60 minute classes with 20 minute breaks in between, and a 30 min. Yoga Nidra ( the Yogic sleep). To be hosted by 4 different specialist intructors offering their own unique forms of yoga . This is what you can expect …. Laurence Milner (Chaitanya School of Yoga) will host YIN YANG YOGA (YYY) , not be confused with Yin Yoga . YYY is a recent introduction in studos throughout Europe and the USA , and is a blend of gentle Vinyasa infused with elements of Tai Chi . Its gentle flow mixed with elements of Tai Chi and Shaolin will certainly test your stamina , but leave you feeling incredibly relaxed yet gifting you with gentle energy . Madelain Burgoyne ( Mad about Yoga ) and more recently ( Mad about my Life ) Although Madelain is trained in Hatha yoga, she likes to mix up yoga with primal principles of functional movement, callisthenics & intermittent fast paced interval training. It’s nothing short of playful, challenging, mixed with a little bit of flow & creative improvisation . Madelain doesn’t belong to any one yoga tradition, but is rather, a student of Movement overall & follows the philosophy of biologically appropriate Movement coupled with effective efficiency. Madelain landed her first corporate yoga-teaching contract in 2011 & that lead her to pursue her Yoga teacher certification with additional training in Sadie Nardini’s, Core Strength Vinyas yoga tm Style. 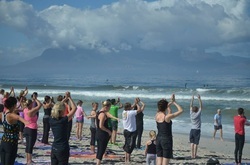 In 2012 Mad About Yoga was born & Madelain held underground group yoga classes & coached private clients around Cape Town. In 2013, she turned Mad About Yoga into Mad About Movement. Maya Haripal Kaur ( Shakti Dance ) is a qualified Kundalini yoga and Shakti dance instructor and musician. She trained with the founder of Shakti Dance in Italy, 2008, and has taught in Europe and the UK before moving back to live in Cape Town in 2011. Known as 'the yoga of dance' or the dance of awareness, this new and contemporary dance form incorporates the teachings of kundalini yoga and includes aspects of hatha yoga and some elements of chi gung & tai chi-based as well as many other dance styles all fused into a powerful flowing movement practice called Shakti Dance. Using flowing asanas with breath, mantras and mudras, we move through 8 phases in a session which will raise the prana-Shakti in the body as it connects the dancer to deep states through conscious movement. The yoga of the dance is also effective at locating an inner stillness in the dance, and exploring the ever-present dance which moves through all of life. Mirja Roth ( Yoga Nidra meditation) is a German qualified Ashtanga Vinyasa and Yoga Nidra Meditation instructor, since 2010. All levels welcome. No yoga or dance experience necessary; just bring an open mind and open heart. And finally to end off this celebration of yoga we will host a 30 minute Yoga Nidra ( Yoga of sleep ) or guided meditation . RESERVATIONS ALL PAYMENTS EFT OR CASH AT THE SCHOOL BEFORE 24 MAY. You can register here and/or call Laurence 083 632 9434 for any detail. Saturday February 6, 2014, from 8.30 AM to 10.00 AM, on Blouberg Beach, opposite "Doodles". #1 Performing yoga in the sand strengthens secondary muscles Sara Ivanhoe says, "Practicing on an uneven surface like sand builds the secondary muscles in your feet, hips, knees and shoulder joints." Ivanhoe is a yoga instructor in Santa Monica, California. #4 Sunlight is beneficial to the body Being in the sunlight is beneficial to the body Sunlight helps by decreasing the chances of one obtaining cancer because it helps the body make vitamin D. The light from the sun is also helpful to those with SAD (seasonal affective disorder). There are also studies that prove high levels of vitamin D can decrease the risk of one getting multiple sclerosis (MS). To finish off and reward you for your efforts we will have an extended and relaxing Yoga Nidra ( Yoga of conscious sleep ) or guided meditation. Price R250 pp . Your reservation and confirmation of payment will secure your place at the workshop . Restricted to 20 students only on a first pay basis. Banking details on request . Meditation workshop is a brilliant place to learn how to meditate, as it offers vital basics on meditation, so enrolling in one is extremely beneficial if one wants to learn about meditation. Meditation can bring about amazing stress reducing benefits, hence it is important that you consider its use in everyday life. In our high pressured lives, stress reduction is of the utmost importance. In this meditation workshop, you will acquire knowledge on the basics of meditation. You will get information on how t...o practice personal meditation safely. It is an intensive course in meditation and is ideal for busy individuals who want all the basics and would then go away and reflect on what they have learned as well as practice it, bringing about all the benefits. FREE YOGA DAY!!! JUNE 22 2013, FROM 12.00 TO 14.00. Karma yoga is described as a way of acting, thinking and willing by which one orients oneself toward realization by acting in accordance with one's duty (dharma) without consideration of personal self-centered desires, likes or dislikes. One acts without being attached to the fruits of one's deeds. Nothing can be compared to the feeling of snuggling in a blanket on a chilly winter morning. Waking up lazily to a cup of hot coffee, sipping it while enjoying the mist outside the window, or chewing on nuts and ...dates in the evenings: Winter brings with it all these luxuries and more. But it is also involuntarily accompanied by dry skin, chapped lips, body ache, cold, cough, viral infections, and joint pains. Not to forget a general dull and gloomy feeling, which is an unsolicited gift of the weather outside. During the winter the body tends to need more sleep and yoga has been researched to help people get people sleep. Many times people suffer from the inability to get lots of deep sleep and taking yoga classes allows them to sleep much better almost right away. The ability to help stretch and relax the body does wonders for the body, mind, and spirit during the cold season. Yoga can be your additional protective cover this winter, providing you warmth and the strength to fight common infections. So join us for a 2 hour FREE intensive introduction into this wonderful science. YEAR END MEDITATION AND FIRE CEREMONY "YAJNA" - DECEMBER 31 2012, FROM 2,00 PM TO 3,30 PM. Year End Meditation or in short “YE” Meditation or just “YEM”, is a special occasion meditation. As the name suggests it is done at the tail end of the year. It is different than the New Year Meditation, where we only focus on the new, the next, being totally oblivious to the past. And that is one of the main reasons many of the New Year resolutions wear off in just few days, because we fail to see the overall big picture and the connections, in which past does play a role. In Year End Meditation, we run through the passed year in our Mind. Start from the beginning of the year. The plans you had, the resolutions you made, the wishes, the hope and the promise you had at the start of the year. Then what happened in the end? Was it a good year? Did things work out as you planned? Or it turned out to be a horrible year, the worst till now? Did you get hit financially? Did you loose your love? Did you loose your family? And has this thing happened again? When exactly your path deviated in the year? What made you take the detour from the original plan? Did you realize the mistake? Were you aware enough of what you were doing and what was happening as a result? Were you able to come back to the right path? Or did you drift further? I am also letting go of any expectation as to how this year will unfold. What I do know is that I have narrowed the focus of my commitments so that I may fuel my potent energy toward them, such that they are realized as is Divinely intended. With meditation, I set my intentions. Remember, the Universe reads emotion and intent. When these are in alignment, our desires happen more swiftly and easily. We will conclude this event with a fire ceremony ( YAJNA ), asking you to write down on paper all the negative thoughts , actions , deeds experienced this past year after which you will dispel the paper into a burning fire thus freeing yourself and your mind for the new year ahead. Chaitanya School of Yoga is happy to announce the introduction of Kundalini Yoga classes, held by Laurence, every second Saturday. Kundalini is the yoga of body and hands mudras-gestures, of breathing and mantras, and our classes includes aspects of hatha yoga and some elements of chi gung & tai chi-based, taking the form of a flow movement, closing in the end with mantra meditation. Desinged entirely by Laurence, with the purpose of awakening and raising the pranic energy in the body, this class will help the practitioner to connect to high states of mind, and to the calming emotions of the heart. All levels welcome. No yoga experience necessary. Just bring your open mind and open heart. This event will take place at Chaitanya School of Yoga, every second Saturday from 10.00 to 11.15 Am. ASK YOURSELF: 1. Am I stressed? 2. Am I depressed? 3. Am I struggling to sleep well ? 4. Am I easily angered/annoyed/irritated ? 5. How is my spiritual health ? 6. Am I lethargic and have no energy? If you have answered YES to any of these few examples then JOIN us for this intensive and practical workshop and DISCOVER how easy its is to REMOVE these negative elements from our life. Meditation workshop is a brilliant place to learn how to meditate, as it offers vital basics on meditation, so enrolling in one is extremely beneficial . Meditation can bring about amazing stress reducing benefits, hence it is important that you consider its use in everyday life. In our high pressured lives, stress reduction is of the utmost importance .In this meditation workshop, you will acquire knowledge on the basics on meditation. You will get information on how to practice personal meditation safely. It is an intensive course in meditation and is ideal for busy individuals who want all the basics and would then go away and reflect on what they have learned as well as practice it, bringing about all the benefits. for people with little or no previous experience of meditation .This workshop will provide a structured introduction, as well as strong methods in cleansing, energizing and concentrating the mind . It will also create an opportunity for people who have done other forms of meditation to explore the particular breathing mindfulness technique, with opportunities ...for discussion and individual progressive guidance. Our workshop will be on the 29th October , however, it will be an introduction to Meditation as opposed to a full blown workshop like we have had in the past . This will result in a cheaper price for ALL , and the whole aim is to continue the classes on an on going basis , creating a regular group , which will come together weekly or bi weekly in the weeks and months to come . The idea is to teach a different technique , every time we meet , give the student a chance to practice till we meet again , and then answer any questions re problems and or experiences they might have had during this period . This will allow you to attend the group whenever convenient and should you want to attend it can be based on R75 per class or we can offer you 8 classes for R 350 valid for 2 months Seats are limited to 15 people per session and booking is essential . Date : 29 October 2011 Time : 1pm – 3pm. Confirmation of your reservation will be given on receipt of payment . Weekend or longer courses for beginners and intermediate students to Meditation will be held at Chaitanya School Of Yoga in Tableview. For people with little or no previous experience of meditation these courses provide a structured introduction, as well as strong methods in cleansing, energizing and concentrating the mind. They also provide an opportunity for people who have done other forms of meditation to explore the particular breathing mindfulness technique, with opportunities for discussion and individual progressive guidance. The weekend courses include group practices, individual practice time for Sitting and Walking Meditation, Mantra Meditation, Dharana and Trataka, discussion, and one-to-one consultations with the teachers, regarding obstacles in reaching meditative states and methods of eliminating them, as well as giving new and higher directions for intermediate and advanced students in meditation. For people who wish to continue with the meditation practice, some contact with a group and a teacher provides support in developing meditation. • You can sign up for a full month contract, maintain permanent contact with the teacher for a more intensive practice in group, and continue for as long you need till you develop strong skills in Meditation. The main meditation technique we use is based on Mindfulness Of The Breath. It is developmental and is taught in stages over several months. Classes are normally held weekly and provide an opportunity for group practice, discussion, talks about the Buddhist, Hindu and Zen spirituality and individual discussion with a teacher about your practice progress. This meditation is an effective but gentle way of training the mind to develop inner strength and freedom from turmoil. This produces a happier and more unified state of mind, leading on to clarity and understanding. This path from calm to insight (shamatha to vipassanā) was followed by the Buddha himself and is a central tradition of Buddhist meditation. Join us in the third of a series of workshops where we will endeavour to restore and awaken the 7 chakras ( energy centres) of your body. Come enjoy this wise combination of gentle restorative yoga, color therapy, sound healing with color therapy, meditation & visualization tools to enhance the energy flow in your chakras! This is the key Chakra healing for decision makers, directors, managers, sales men and woman, public speakers,as it is the center of human personality, and is beneficial to all who suffer from anger ,short temper ,irritability , depression , lack of ambition, lack of confidence and inner strength . Awaken your Solar Plexus center & and boost your personal power, develop your personality. Also a key for slimming, toning and speeding up you metabolism. Your Solar Plexus Chakra is SUPER important! It governs your visual sense. The digestive system, automatic nervous system, gall bladder, stomach, liver and spleen are all affected by the state of the solar plexus chakra. Problems such as ulcers or eating disorders may signal an imbalance here. A balanced Manipura results in a feeling of inner peace and happiness, the opposite being discontent and discouragement, low self-esteem, always feeling like a victim, shyness. Remember this is the chakra of Personality. We will unwind and unravel stagnant blocked energy in this important chakra tonight for a deep healing. You'll definitely leave feeling like you know what strength and confidence, and what deep inner peace feels like. Come dressed in YELLOW to deepen into the color consciousness! In celebration of our 2 year anniversary we invite everybody to join us for a 2 hour intensive introduction to this wonderful science. Come dressed in loose comfy clothing , bring along a yoga mat ( or a large towel if you don’t have one ) , an open mind , and be prepared to feel the benefits YOGA has to offer. BOOKING IS ESSENTIAL – We will run more than 1 session if necessary. Keep visiting our site for news. Date; SATURDAY 5 NOVEMBER FROM 12h00 to 14h00, at Chaitanyayoga venue. PRICE – FREE FREE FREE FREE BOOK HERE. GO TO CONTACT US PAGE AND SEND YOUR PERSONAL DATA TO REGISTER. EVERYBODY IS WELCOMED. SEE YOU ALL SOON, AND LET'S ENJOY A DAY OF WORKOUT, RELAXATION AND HUMAN CONECTEDNESS, JUST FOR FREE! Chaitanya School of Yoga is pleased to announce a special Fully Clothed TANTRA WORKSHOP for WOMEN ONLY in Tableview, Cape Town, presented by Tantric Yoga Teacher Rosalyne. Find the life force flow in yourself through finding your own powerful breath. Learn skills of bonding with yourself and others. Learn touch steps that will allow you to circulate your energy. It is surely the ultimate skill to learn in this life. We use Tantric Breathing rituals and techniques, Tantric Self Touch rituals and the Circulation of Life Force Energy, Tantric meditation intensive training and more. Learn to use your life force to actualize your spiritual potential, to become more playful and ecstatically aware in your life, to expand your capacity to give and receive love, to free yourself from the limits that hold you back from unbounded joy, bliss, love, and intimacy. Heal yourself of past trauma, eliminate stress, empower and relax, restore your health youth and vitality, restore your beauty, rejuvenate your mind and body. Learn to feel more and help your life partner to love you more. Heal yourself and others through touch. Find the life force flow in yourself, find it in others and circulate it between yourself and other. In our intensive Tantra Workshop you will experience the extraordinary gift of being fully alive by living your life from within. Price : R350 booking is essential. Date and time : 2nd July 2011 1pm – 4 pm. Cut off date for bookings 30 June. Book early to avoid disappointment. You can register here or call Laurence 083 632 9434. 1. Am I stressed? 2. Am I depressed? 3. Am I struggling to sleep well ? 4. Am I easily angered/annoyed/irritated ? Tuesday, April 26 · 7:00 pm - 9:30 pm. Nothing is more precious than your vision , yet many people find there vision worsening due to modern lifestyles and the cultural beliefs about the "inevitable" decline of health including VISION. Our Holistic workshop offers programs to help you keep healthy vision all your life . We will teach you , good visual habits , practical exercises to be done daily over a determined period of time ,helping you improve your eye sight and prevent eye disorders. 1. Improve the administration of oxygen in the area of the eyes. 2. The circulation of blood and thus oxygen in the whole head. 3. Improve near sightedness , far sightedness , tension and pain. This workshop is mainly practical , so dress comfortably and prepare to leave feeling happy , relaxed and enlightened. Written material will be provided in the form of a take home pack. This workshop is restricted to 15 people and reservations will be confirmed on receipt of payment . Please ask for details on payment. Join us in the third of a series of workshops where we will endeavour to restore and awaken the 7 chakras ( energy centres) of your body. Come enjoy this wise combination of gentle restorative yoga, color therapy, sound healing with color therapy, meditation & visualization tools to enhance the energy flow in your chakras! MANIPURA CHAKRA - SOLAR PLEXUS - CORE. This is the key Chakra healing for decision makers, directors, managers, sales men and woman, public speakers, and is beneficial to all who suffer from anger ,short temper ,irritability , depression , lack of ambition, lack of confidence and inner strength . Awaken your Solar Plexus center & and boost your personal power. Also ideal for slimming, toning and speeding up you metabolism. Your Solar Plexus Chakra is SUPER important! It governs your visual sense. The digestive system, automatic nervous system, gall bladder, stomach, liver and spleen are all affected by the state of the solar plexus chakra. Problems such as ulcers or eating disorders may signal an imbalance here. A balanced Manipura results in a feeling of inner peace and happiness, the opposite being discontent and discouragement, low self-esteem, always feeling like a victim, shyness. SEATS ARE LIMITED TO 20 PEOPLE AND YOUR RESERVATION WILL BE CONFIRMED ON RECEIPT OF PAYMENT . ALL PAYMENTS MUST BE PAID ON OR BEFORE 28/03/2011 . PAYMENT CAN BE MADE BY EFT (DETAILS ON REQUEST) OR CASH AT THE SCHOOL. Ask for details. AMAZING LUCKY DRAW PRIZES FROM OUR SPONSORS ON THE NIGHT! Join us in the second of a series of workshops where we will endeavour to restore and awaken the 7 chakras ( energy centres) of your body. Come enjoy this wise combination of gentle restorative yoga, color therapy, sound healing with color therapy, meditation & visualization tools to enhance the energy flow in your chakras! 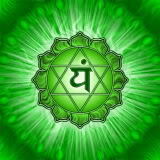 This Month's Focus: Your Heart Chakra (ANAHATA) GREEN energy . This is the key Chakra healing for lovers , couples ,healers ie doctors , and is beneficial to all who suffer from anger ,short temper ,irritability , depression , lack of emotions. Awaken your Heart center & your ability to love and boost your immune system. Are you in touch with your inner spiritual voice? We will unwind and unravel stagnant blocked energy in this important chakra tonight for a deep healing. You'll definitely leave feeling like you know what deep inner peace feels like. Your Heart Chakra is SUPER important! It governs your sense of feeling and emotions , and controls your immune system by a direct influence to your Thymus gland . Keeping you looking and feeling youthful . Come dressed in GREEN to deepen into the color consciousness! SEATS ARE LIMITED TO 20 PEOPLE AND YOUR RESERVATION WILL BE CONFIRMED ON RECEIPT OF PAYMENT . ALL PAYMENTS MUST BE PAID ON OR BEFORE 25/02/2011. PAYMENT CAN BE MADE BY EFT (DETAILS ON REQUEST) OR CASH AT THE SCHOOL. CHAKRA RESTORATIVE AND HEALING WORKSHOP 31 JANUARY 2011 7pm - 9pm. Join us in the first of a series of workshops of 2011 where we will endeavour to restore and awaken the 7 chakras ( energy centres) of your body. Come enjoy this wise combination of gentle restorative yoga, color therapy, sound healing with color therapy, meditation & visualization tools to enhance the energy flow in your chakras! Experience healing restorative yoga, pranayama, mantras, mudras, bhandas, color therapy, & sound healings specific to awakening the pranic flow through your Chakra system. Restores your energy balance on all levels. Leave feeling grounded, joyous & enlightened! NO EXPERIENCE NEEDED. This is the KEY Chakra healing for professional people including team leaders , bosses, doctors, students , learners , writers and entrepreneurs. Awaken your 3rd eye , forehead centre & your ability to concentrate , think , make calculated decisions and be aware of details in every aspect of your life.. Your AJNA Chakra – Pineal gland is vitally important! It governs your sense of knowledge and memory , clairvoyance and insight . Come dressed in Violet or Purple to deepen into the color consciousness! Join us in the second of a series of workshops where we will endeavour to restore and awaken the 7 chakras ( energy centres) of your body. THIS MONTH'S FOCUS: This is the KEY Chakra healing for professional people including team leaders , bosses, doctors, students , learners , writers and entrepreneurs. Awaken your 3rd eye , forehead centre & your ability to concentrate , think , make calculated decisions and be aware of details in every aspect of your life..
Are you in touch with your inner spiritual voice? We will unwind and unravel stagnant blocked energy in this important chakra tonight for a deep healing. You'll definitely leave feeling like you know what deep inner peace feels like. Your AJNA Chakra – Pineal gland is vitally important! It governs your sense of knowledge , clairvoyance , and insight . Come dressed in Violet or Purple to deepen into the color consciousness! SEATS ARE LIMITED TO 20 PEOPLE AND YOUR RESERVATION WILL BE CONFIRMED ON RECEIPT OF PAYMENT . ALL PAYMENTS MUST BE PAID ON OR BEFORE 05/11/2010 . Join us in the first of a series of workshops where we will endeavour to restore and awaken the 7 chakras ( energy centres) of your body. Come enjoy this scientific combination of deep restorative yoga, color therapy, sound healing, meditation and visualization tools to increase the energy flow in your chakras! This is the main Chakra healing for singers, actors, writers and artists, as well as saints and masters! Awaken your throat chakra and unleash your abilities to speak, sing, write, paint, be a Creator, have an unparalelled Genial Intuition and Inspiration. Are you in touch with the voice of your Spirit within? We will eliminate stagnant blocked energy in this important chakra tonight for a deep healing, and a deep awakening of your superior creative faculties. You'll definitely leave feeling a deep inner peace. Your Awakening and Purification Chakra is VERY important! It governs your sense of taste, hearing, your jaw, mouth, teeth, gums, nose and ears energetically, as well as the fluidity in your shoulders and neck. The colour of Vishuddha chakra is BLUE. Come dressed in Blue to absorb into your etheric body the BLUE color of your consciousness! SEATS ARE LIMITED TO 20 PEOPLE AND YOUR RESERVATION WILL BE CONFIRMED ON RECEIPT OF PAYMENT . ALL PAYMENTS MUST BE PAID ON OR BEFORE 12/10/2010. Holistic healing means taking an holistic approach when seeking treatment for imbalances and choosing to live a more balanced lifestyle. What primarily distinguishes holistic healing apart from alternative medicine, complementary medicine, and integrative medicine is that physical health is not necessarily the main focus. Even so, it is often the experience of physical discomfort that will first prompt a person's pursuit of holi...stic healing. Holistic or "wholistic" healing addresses all parts of the individual, not just the physical aspect of a person where manifested illnesses are most apparent. Holistic healing is not intended to serve as a band-aid or a one time fix. It is an ongoing journey of discovery in search of more answers and ultimately; living better, being healthier, and striving for wholeness. 1. Am i stressed? 2. Am i depressed? 3. Am i struggling to sleep well ? 4. Am i easily angered/annoyed/irritated ? 5. How is my spiritual health ? 6. Am i lethargic and have no energy? 7. Do you have everything, and yet you still feel empty inside? If you have answered YES to any of these few examples then JOIN us for this 2 day intensive and practical workshop and DISCOVER how easy its is to REMOVE these negative elements from our entire being and life. Learn to MASTER yourself, and be HAPPY in any situation. BOOKING IS ESSENTIAL AND LIMITED TO 20 PEOPLE ONLY. REGISTER ON FACEBOOK OR GO TO CONTACT PAGE AND FILL IN THE FORM. 2. TRATAKA ( Eye fixation ( gazing) upon various objects, including a flame, a yantra etc.) for concentration of mind, and opening of the Ajna Chakra, the third eye. 3. JAPA YOGA MANTRA ( audibile chanting ) with various Bija mantras for calming and concentrate the mind, and aquire the power to meditate. 5. MEDITATION WITH MUSIC ( very specific, carefully selected music ) for opening Ajna, Anahata, Vishuddha Chakras. Meditation workshop is a brilliant place to learn how to meditate, as it offer vital basics on meditation, so enrolling in one is extremely beneficial if one wants to learn about meditation. Meditation can bring about amazing stress reducing benefits; hence it is important that you consider its use in everyday life. In our high pressured lives, stress reduction is of the utmost importance. Where to begin when one is trying to practice meditation can be very hard, not only are there a lot of materials on the market, many of them cost a lot of money. In this meditation workshop, you will acquire knowledge on the basics on meditation. You will get information on how to practice personal meditation safely. It is an intensive course in meditation and is ideal for busy individuals who want all the basics and would then go away and reflect on what they have learned as well as practice it, bringing about all the benefits. You will find after taking this meditation workshop, that you,ll became very calm and collected, which will be translated into better relationships with all those around you. Meditation improves your mental well being. You have a clearer mind as well as better concentration, so the vast wealth of benefits meditation brings is unbelievable. To tap into this vast mine of potential, one has to take that first step and the easiest route is through this meditation workshop. Never done yoga before? Always wondered what all the hype was about? Well now is the time to find out!! 4 weekends of basic yoga , including Asanas ( body postures ) , Pranayama (breathing techniques) , Meditation and Relaxation . Join Rosalyne ( 16 years experience ) and Laurence for this informative workshop , discover and feel the benefits this ancient science has to offer! REGISTRATION AND PAYMENT ON OR BEFORE 30 of June. BOOKING IS ESSENTIAL. When: Saturdays and Sundays morning 10 am -11 am. AWAKENING OF THE 7 CHAKRAS - Workshop - 5 days, starting monday the 29th of march 2010. JOIN US FOR A ONE WEEK EXPERIENCE OF INTENSIVE YOGA. ROSALYNE WILL ENDEAVOUR TO AWAKEN YOUR 7 CHAKRAS ( CENTERS OF ENERGY ) . 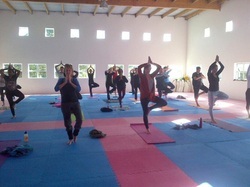 We organize weekend Yoga workshops with the accent on Hatha, Kundalini, Kriya yoga, Pranayama and Meditation practice. The session is followed by group discussions about spirituality, as well as private discussions about any personal issue ( health, practice, etc) with Rosalyne. For information contact us at Chaitanya.yoga1@gmail.com, or navigate to the contact page and fill in the existing form. The ten Mahavidys as described shortly here, represent the ten aspects of the Absolute feminine, and is an integrant part of Tantra ocult tradition, worshiped by the Yogi in order to attain the respective psychic powers over elements, to conquer them. 2. On request for advanced students, who can prove that they had allready completed a training in Hatha Yoga and Pranayama Yoga. Written literature pertaining the received initiation. Fees for initiations : On request. these mantras being able to bestow upon the Yogi great Siddhis, and to attain finally the ultimate realization. Contact us for informations and registration, on the contact page.